Sydney Shop Girl: Friday Drinks #17: Summer Ready. Summer Reads. SSG Manor 2.0 is officially ready for summer. While I personally am years to never away from being beach body ready,.. our freezer is now stocked with a mix of both Zooper Doopers and marginally better for you Berri Quelches. I do, however, have the makings of 'beach face' thanks to this generous Beauty Loop gift from Mecca Cosmetica. Inside the hot pink box were 2 full sized products from the Mecca house label - a peach lip balm with SPF 25 and a bottle of illuminating drops which you can mix into your favourite foundation or tinted moisturizer. I'm planning on using both this weekend as I flit from one social engagement to the next. I'm not joking, for once, I actually do have a couple of glamorous get togethers scheduled in between my usual mum life engagements. Watch this space. Preschooler SSG is all set for the Melbourne Cup. This is a hat he made at preschool this week and he got lots of compliments on it while were doing the shopping the other night. My favourite design elements are the generous sweeps of glitter and the tail he added that looks great either flowing down his back or pulled to one side of his face. There's a blue bottle top on the hat somewhere too because upcycled embellishments are everything this season. I love it all. But then again, I am biased. In the spirit of living life to the full by trying new things, I ordered a long black for my hump day coffee. I do believe it's the first time I've ever ordered one and it won't be the last. They seem to deliver that espresso hit more cleanly than my chocolate and froth laden skinny caps. The only thing is that I need both a dash of cold milk and heaped teaspoon of sugar with my long black to make it my drink. I wonder how I would order that? Any suggestions would be greatly appreciated. As we head into summer and the thought of that Christmas / New Year break ... I have a new favourite author to share. Shari Low hails from Glasgow and she writes the most addictive modern day comic romances with a side of chick lit for the thinking woman (I completely made that genre up) under her own name as well as novels in other genres under pseudonyms. I've been working through Shari's entire back catalogue and have loved each novel. 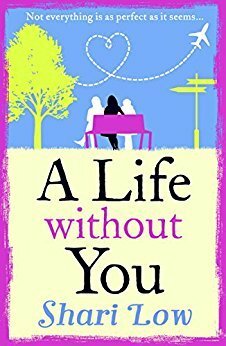 'A Life Without You' is the story of Jen as she struggles to get her life back on track after first losing her best friend Deb in a car accident and then the collapse of her own long-term relationship with her partner. In the hazy weeks that follow these events, Jen rebuilds her life in stuttering steps thanks to the love and support of Deb's family who adopted Jen when her own mother died. Jen discovers Dee's secret life, she and Deb's husband Joe build a friendship and we also learn about how Deb's mother Val is struggling with her desire to avenge the death of her daughter by stalking the mother of her murderer. There are so many disparate themes in this novel but Low weaves them all together in a warm, funny and suspenseful read. Can you believe it's going to be November next week? I'll just leave that with you. There is a great book called Young Jane Young. Read that. Also Australia Day by Melanie Cheng. Gonna go get my L2 beauty loop box. It has been said "if your coffee order is more than four words, you are part of the problem", however I order a long black with some milk on the side if I am having in. Usually the places I order a milk stained long black, they will let me monitor the amount of milk that goes in. Have a lovely time on your outings. Outfit pics too ploise. I'm in denial that it's going to be November next week, it's just snuck up! I really need to get more organised with Christmas, I made a start this month but it's fallen by the side again!